Salman Khan’s Prem Ratan Dhan Payo is gearing up for a massive Diwali release, and the team has been busy with the promotional activities of the movie. 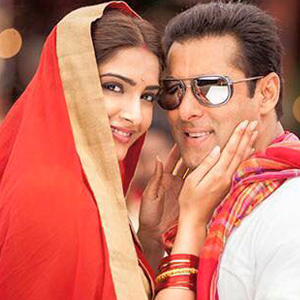 Now, Salman has compared with Sonam Kapoor look to Aishwarya Rai Bachchan. has been unveiled from PRDP, her look has been compared to Aishwarya Rai Bachchan’s role in Hum Dil De Chuke Sanam, as even the film’s posters look so similar. But Salman Khan has commented, “Sonam is as beautiful and as talented.” Well, looks like Salman Khan has smartly taken the sides of both the heroines. Directed by Sooraj Barjatya, Prem Ratan Dhan Payo is produced by Rajshri Productions with music by Himesh Reshammiya, Sanjoy Chowdhury.